Looking for a unique, personalized baby item to give or to get? Consider taking a look at these shoes from Kids N’ Caboodle. When I first opened the box what really stood out was, other than my son’s name embroidered across the top of the foot, how ultra-soft the leather was. I’ve seen lots of shoes with this basic style for babies and toddlers (Robeez, Bobux). But the leather on these is more supple and has a higher quality feel. However, they are significantly more expensive than those better-known brands ($35.99 includes personalization, shipping and handling). They offer a large assortment of customizable colors and styles. Depending on the shoe style, different fonts are available as well. I received a sample from their “Soft Soul” line. This style features the leather in a dark blue/light blue combo with dark blue letters. In the two tone style they have quite a large selection, 19 shoe colors and 16 text/ankle colors. I received their smallest size, which was still way too big for my newborn. Good thing he’s not in need of shoes just yet! By the time he gets to the age where he likes to pull off his socks, the gathered elasticized ankle should keep them in place. Other shoe options include solid color leather, suede and shearling finish at the ankle (to keep those baby ankles warm in the winter). They have additional options under their “Bouges” line for boys and girls. For boys, it includes various sports themes. The baseball and hockey shoes look well-balanced without personalization (the hockey ones are especially cute!). The football and soccer styles could go with or without it. Too bad I didn’t know about Kids N’ Caboodle when I had my girl. Their Organza Bow Bouges shoes are adorable! This line of shoes runs $29.99 and includes personalization, shipping and handling. Again, a bit pricey, but custom items tend to be that way. If having your choice of colors and the ability to make the shoes unique is important, then these are for you. Another bonus, you’ll never get your kid’s shoes mixed up at another play date again! About: Kids ‘N’ Caboodle’s founder is a former elementary and nursery school teacher. She owned a successful children’s retail store for over 22 years. While a merchandise buyer for the store, she enjoyed finding unique, adorable, and affordable baby gifts for her customers to select. Buy: ThatsITmommy readers save 10% by using this code: CREATE. Visit http://www.kidsncaboodle.com and view their shoe collections. MAIN ENTRY – Visit http://www.kidsncaboodle.com. Take a look around and tell us what your favorite pair is and why. Come back here and leave a comment in the comment box below this post. Extra entries – You can earn more entries. Leave each extra entry in a separate comment. 1 Extra Entry – Subscribe to our RSS feed or by email (or let us know if you already subscribe). 1 Extra Entry – Follow us on Twitter and let us know. 1 Extra Entry – Follow us on Facebook and let us know. 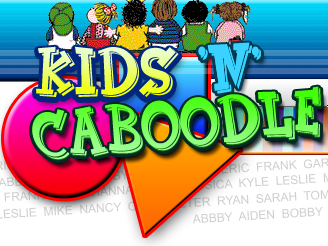 1 Extra Entry – Follow Kids N Caboodle on their Twitter page and let us know. 1 Extra Entry – Tweet this giveaway. Copy and paste – I entered to win a personalized pair of Kids N Caboodle shoes! via @thatsitmommy & @babyshoegirl http://wp.me/pAWsG-Mg #giveaway* Let us know that you tweeted in a separate comment. Come back daily! This giveaway will run through midnight on April 14, 2010 (PST) with winner being announced sometime before April 16, 2010 (PST). Winner will be chosen using Random.org from all valid entries and notified via email. Winner will have 48 hours to contact us before another winner is chosen. Giveaway is open to U.S. and Canadian residents only (18+). * We did not receive monetary compensation for this review. * Heather did receive a pair of shoes to facilitate this review. This will in no way sway our opinion of the service. The review is in our own words and is our opinion. Your results and opinion may differ. A “Fresh & Easy” Summer! I have baby girls and I can’t decide whether I love the pink, white or the red organza crib shoe the best! They all are just precious and oh how I wish I had had a red pair for both Christmas and Valentines Day! And the white and pink are just right for church…and the black, well the black ones are so elegant. As cute as they are, what really strikes me is that from what I see in the photo I much prefer the way the shoe is fitted around the ankle. Robeez tend to leave marks on a baby’s ankle and these appear to be made in such a way that they would be less binding. I hope that I win and if I do, I promise to have made a decision by that time on which one is my favorite. I (freestuff4mom) is now a proud follower of That’s It Mommy on Twitter for one (1) extra entry! I love the soccer shoes, they are adorable! The soft sole 2 tone pink are my favs! My favorite is the PERSONALIZED BLUE LEATHER BASEBALL and BAT CRIB SHOE. They would be for my nephew, and his Daddy, my brother, is a baseball fanatic! I like the flower loafer baby girl ones because they would be perfect for my little niece who will be here in June. I love the deep pink and white for a friend who just had a baby girl! My favorite are the soft soled shoes, becuase they seem the most fitting for new borns. my favorite colors that they offer are navy and light blue. I have a little boy and his brother just started playing little league, so I would choose the baseball and bat shoes. I like the baseball and bat crib shoe! I really love the PERSONALIZED RED LEATHER ORGANZA BOWS CRIB SHOE — how cute!! Thanks for the chance to win. I like the pink color with the tan text and ankle color. I would have my daughter’s name in font 3.
love the solid soft soul in red because they would be so cute for my darling grandson! I really love the crocheted first Mary Jane shoes in white with the pink buttons. So cute. I like the SUEDE SOFTSOUL in blue.They would look really cute with any outfit for a boy. deep pink & bubble gum toddler shoes! My favorite pair is the PERSONALIZED BLUE LEATHER BASEBALL and BAT CRIB SHOE WILL WIN HOME RUNS! Why? Because I have 3 boys and it’s baseball season!! love the blue soccer ones!!! My fave is the PERSONALIZED BLACK LEATHER ORGANZA CRIB SHOE! So dressy! Thanks! The personalized white organza crib shoes are my fave. So sweet! I love the cute personalized pink organza crib shoes! i like the 2 tone softoul shoes in black with deep pink stitching because they would go with lots of my daughter’s outfits! Soft sole in lilac since it’s one of my twin’s colors. I love the Crochet Kisses shoes because they’re so cute!